With the exhibition “Eliseu Visconti-150 anos,” São Paulo’s Galeria Almeida e Dale is celebrating the century-and-a-half since the birth of this artistic pioneer. 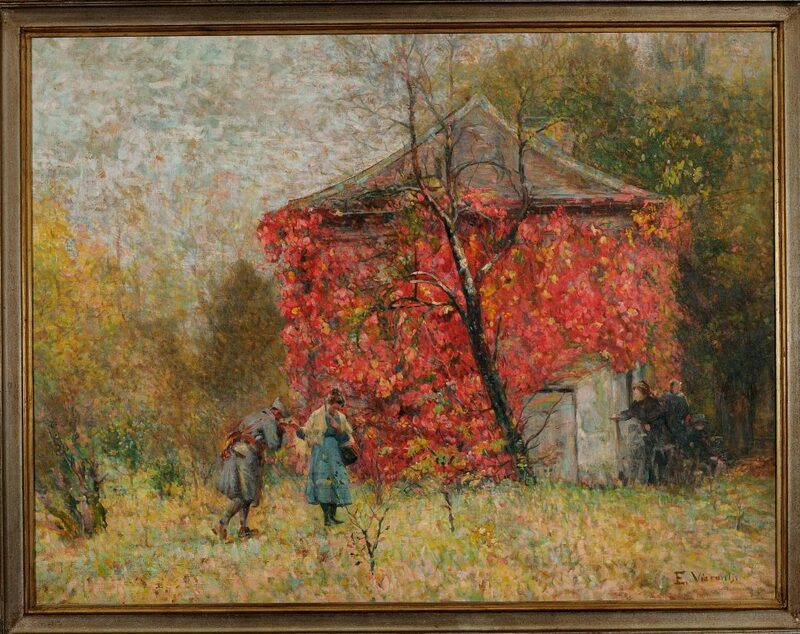 The show displays forty works from his earliest days in 1880 to others produced in the late 1930s, all published in a comprehensive catalog. “It’s time to reinstate his comprehensive artistry a degree forgotten today,” says art historian Christina Penna, consultant for Projeto Eliseu Visconti and the present exhibition. Spanning a sixty-year career, Italian-born Eliseu Visconti (1866-1944) is generally credited with introducing Modernism to Brazil. 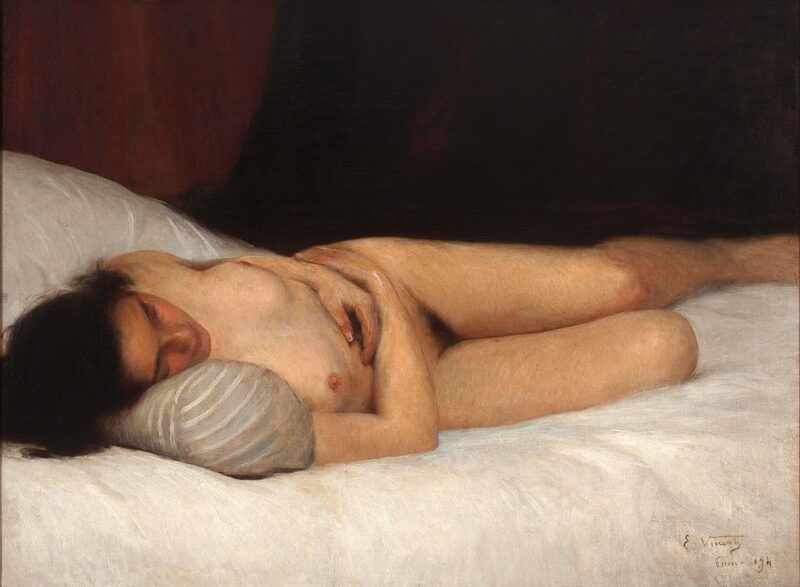 His prodigious talent excelled in several painting techniques from academic styles to neo-realism, making him Brazil’s leading representative of the impressionistic school. To flee distressed Italy of the Risorgimento, his parents embarked with the boy at age seven for the New World, following his eldest sister who already worked for a coffee baron in São Paulo state. In his time, Brazil’s last emperor and three presidents all requested that his art be displayed in public buildings of the old capital of Rio de Janeiro. Visconti is in major museums, private collections and institutions abroad such as the Brazilian embassy in Washington D.C. The National Museum of Fine Arts (Museu Nacional de Belas Artes) in Rio boasts the broadest collection with forty-four works, including oil paintings, drawings and ceramics, the three main activities of an artist who produced about a thousand works in his lifetime. One of its treasures, “Gioventù” (Youth), dubbed Brazil’s Mona Lisa, depicts a neo-Renaissance symbolist portrait of a naked pubescent girl, completed two years before it was awarded a silver medal at the Universal Exhibition Paris 1900. In 2001, this unusual portrait figured in the catalog of the collective exhibition “Brasil Body & Soul” at the Guggenheim Museum in New York. In his time, Visconti’s works were exhibited in Brazil and Europe, mainly in France where he lived for a while, visited several times and married his muse, the French-born Louise, mother of his three children. In the US alone he was exhibited six times, the first being in the Chicago World’s Fair of 1893 when the twenty-seven-year-old was bestowed a special merit medal. 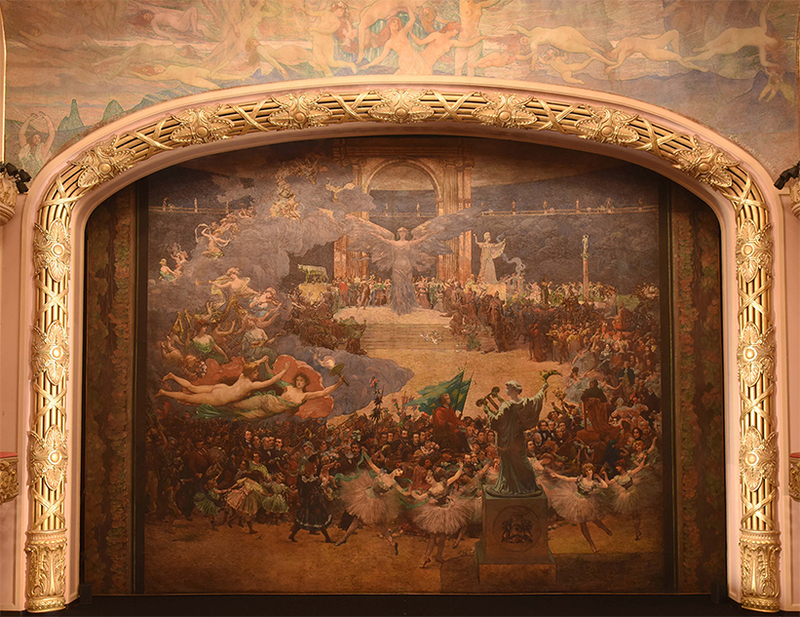 Considered by the artist his most remarkable work and no doubt his grandest achievement is the 6,500 square feet of paintings on the walls, ceilings and proscenium curtain of the Theatro Municipal, Rio’s opera house fashioned in the manner of the Opera Garnier in Paris. The monumental task was executed in Paris because he couldn’t find a studio in Rio with the ceiling height the undertaking required. After his death, Paris, New York, Santiago, Buenos Aires and Lisbon have seen his exhibits due to his grandson Tobias Visconti, who has been promoting and cataloguing his legacy through the Projeto Eliseu Visconti, which he founded in 2005. In addition to Visconti, we interviewed Marcio Roiter, president and founder of Instituto Art Déco Brasil, regarding Visconti’s significant contribution in the field of design, and art historian Christina Penna, an active participant in Projeto Eliseu Visconti since its inception and the organizer of the artist’s catalogue raisonné. Tobias, what are the main influences in your grandfather’s styles of painting? Visconti was a multi-talented eclectic artist. He studied painting in Paris in the height of the Belle Époque. He studied design in Académie Guérin with Eugène Grasset and painting at the Académie Julian, both very prestigious. 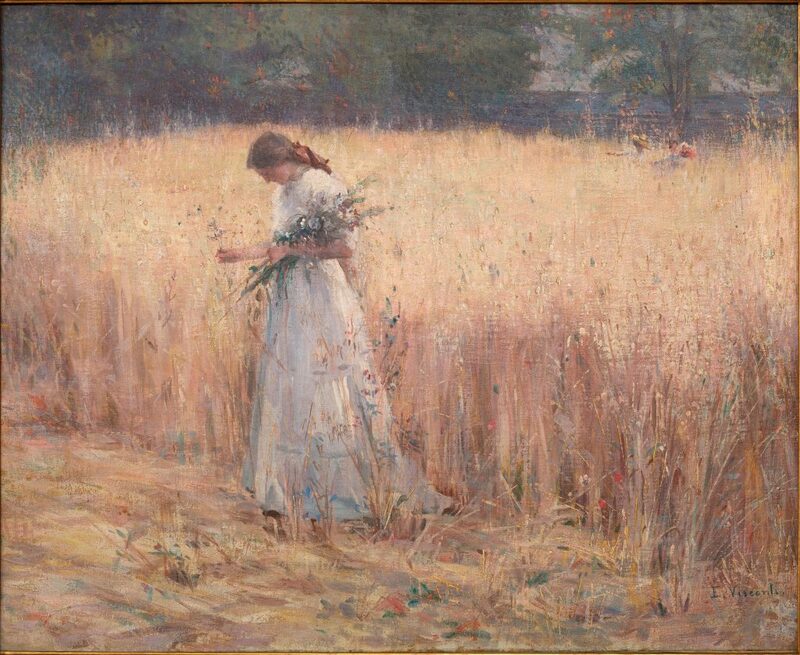 So he was naturally influenced by Impressionism, Pointillism, Symbolism and Art Nouveau, all summing up to constitute fundamental steps in the direction of Modernism. He manipulated all of them with ease and sensibility in a way very much his own, reason why he is acclaimed the most important Brazilian artist of the early twentieth century. Some experts see him as an impressionist painter. 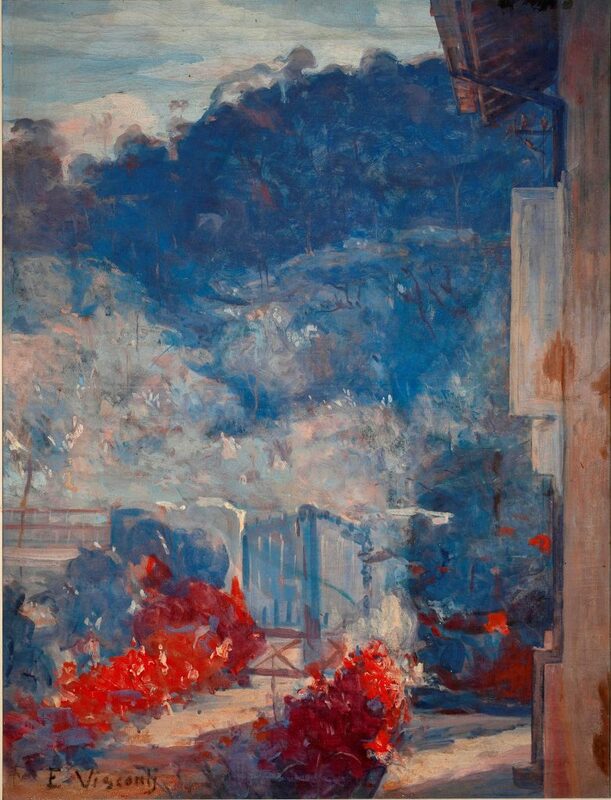 This technique is present in several important works, leading critics and experts to define him as Brazil’s most important impressionist painter. In his pre-impressionistic canvases there are influences of Renoir and Monet but if you observe the impressionist paintings of his Teresópolis phase you will see he adopts very personal characteristics especially in the way he manages the golden tropical sunlight. 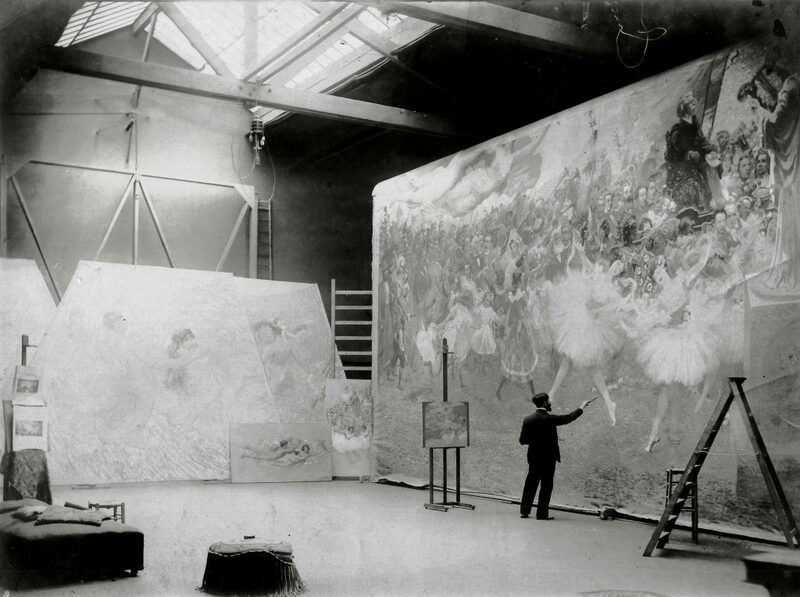 At the same time he has several symbolist works, but you can’t classify him as a symbolist painter. Vuillard and Matisse were also students at the Académie Julian. Did he get acquainted with any of these artists? I know that Matisse was a student at the same time he was enrolled at the Julian. They probably met but there are no records but he did meet Gauguin. Visconti mostly befriended the Brazilian artists who, like him, were studying in Paris: Félix Bernardelli, Angelo Agostini, Marques Júnior, Helios Seelinger and maestro Alberto Nepomuceno. He excelled in so many of the arts. Why didn’t Visconti take on sculpture as well? Actually he studied sculpture. Curiously enough, the first time emperor Pedro II remarked about a work of his was a sculpture called “As Romãs” (The Pomegranates). The emperor saw his talent and told him to enroll at the Imperial Academy of Fine Arts in Rio. The week-long arts festival Semana de 22 (the Week of 1922) marked the official beginning of Brazilian Modernism. Both art critic Mario Pedrosa and Pietro Maria Bardi, founder of the MASP museum, criticized the organizers for not having invited Visconti. What actually happened? It is usually said that Visconti was not invited due to his close ties with the academic artists of the Escola de Belas Artes (School of Fine Arts) and for not having renounced the influence of European academies of art present in his works. The other side of the story is that he had a row with one of the patrons of the festival. There is a hand-written letter by Visconti on this matter, but it doesn’t explain what the feud was about. Visconti’s family was from Salerno in southern Italy, and he was known to be hot-tempered. 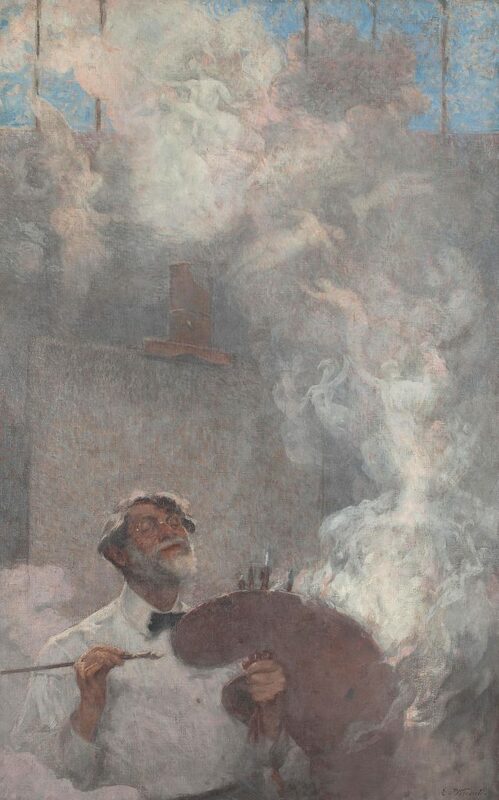 In his lifetime, Visconti did several self-portraits. It’s plain to see he was a handsome man but was he also narcissistic? In Brazilian art, Visconti was one of the painters with the most self-portraits, approximately forty-two from different phases of his career. There are two explanations. He was a very energetic, anxious person. As an artist he was constantly producing works one after the other. When he didn’t find a theme, the right model or nobody in the family was available, he turned to himself. The other reason was his vanity. Your grandmother Louise was very beautiful and your grandfather’s muse. Is she in the allegory he painted in the majestic proscenium curtain of the Theatro Municipal? 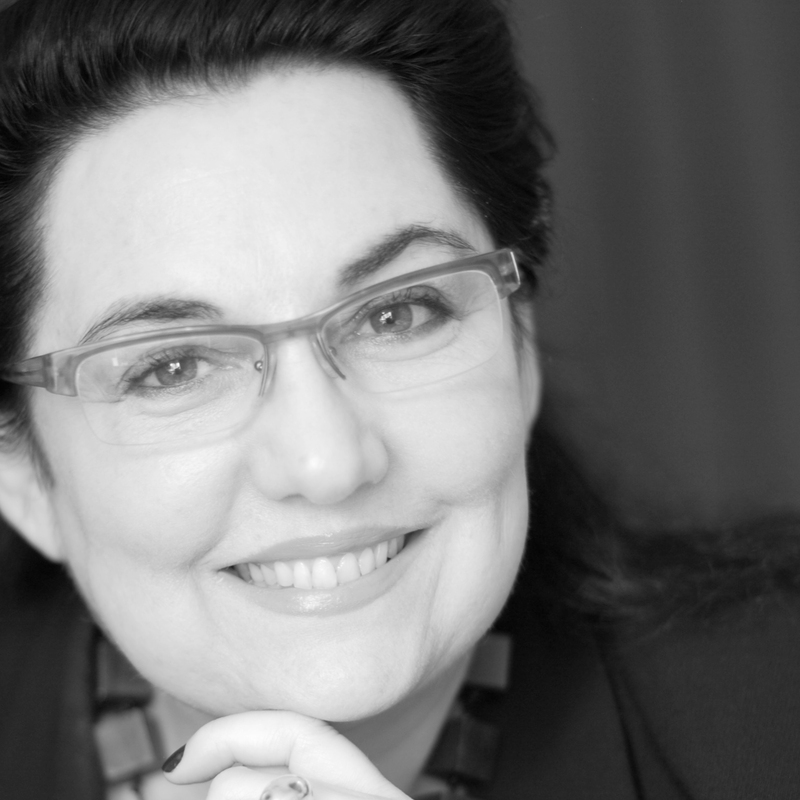 Christina, please give us an overview of the activities of Projeto Eliseu Visconti. Since it was founded by Tobias, our aim has been to reinsert the artist at the place he so rightfully deserves in the arts and design of Brazil. In 2008 and 2009, we coordinated the restoration of all his paintings at the Theatro Municipal, in Rio, organized a large retrospective in São Paulo’s Pinacoteca in 2011, which traveled to Rio’s National Museum of Fine Arts the following year when we also launched the book “Eliseu Visconti: Arte e Movimento,” by Tobias Visconti, published by Hólos editors. Lately we have had exhibits in Brasilia, Recife, Salvador and now in São Paulo at Almeida e Dale for the 150-year celebration of his birth. At the moment, we’re in search of sponsors to produce the Eliseu Visconti catalogue raisonné. This major enterprise will disclose his one-thousand oeuvre for students, experts and art lovers. It will also give an understanding of the Belle Époque in Brazil, a period not well examined to this day. Marcio, tell us of the heyday of design in Brazil and Visconti’s contribution in the process. Eliseu Visconti is the father of design in Brazil. Before him, the Artistic French Mission of 1820 aimed to teach industrial techniques locally but was unsuccessful. To celebrate his studies in Paris with Eugène de Grasset, the pioneer and master of Art Nouveau design, Visconti organized the first exhibit of his works in the applied arts introducing the concept of design in Brazil in 1901 at the National School of Fine Arts (Escola Nacional de Belas Artes) in Rio de Janeiro. In 1926, he had a solo show in Rio’s Galeria Jorge with his designs in ceramics, posters, fabrics, cushion covers, stained-glass windows, wallpapers, book covers, ex-libris, ceramic tiles, lamps, stamps and tapestries. Many of them carried geometric Brazilian Indian motifs later called Nativism, which would influence Brazilian-made Art Déco. He was finally able to establish an extension course in the applied arts in Rio’s university in 1934. One of his iconic designs is the Art Nouveau color-glazed moringa (ceramic water vessel), displayed at the Almeida e Dale exhibit, specially created for the boxes of the Theatro Municipal only for its official opening in July 14 1909. 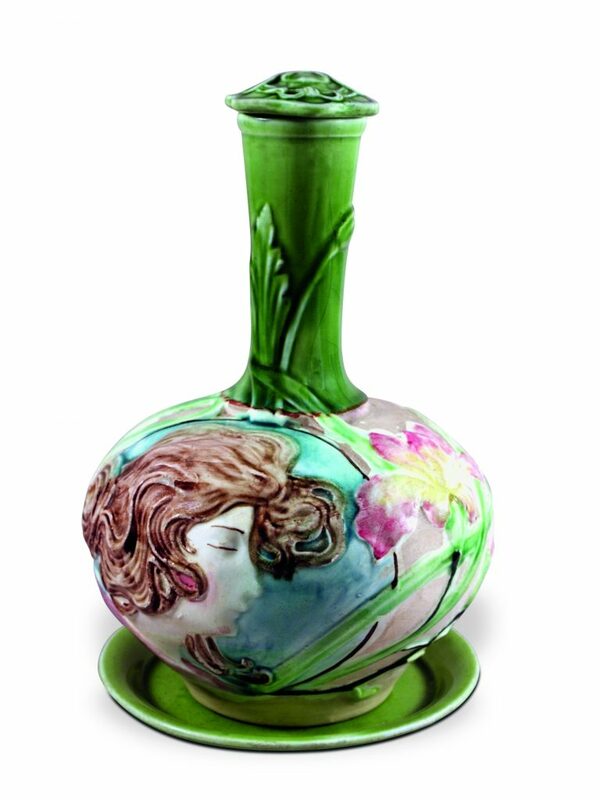 The limited edition of sixty vessels was produced by Ludolf, a Rio-based earthenware manufacturer, with floral decoration and a beautiful female profile with long flowing hair, clearly influenced by Alphonse Mucha’s designs. Funny thing is they were so modern and unique the theatergoers took them home. It’s a cult object, rarely found in today’s market.